Das rasante Spiel für die ganze Familie! An action packed game fo the whole family! Who can shoot their pieces into the opposite field the fastest? Use the rubber band to aim your pucks through the tunnel boundary and shoot them into the opposite field at the opponent. 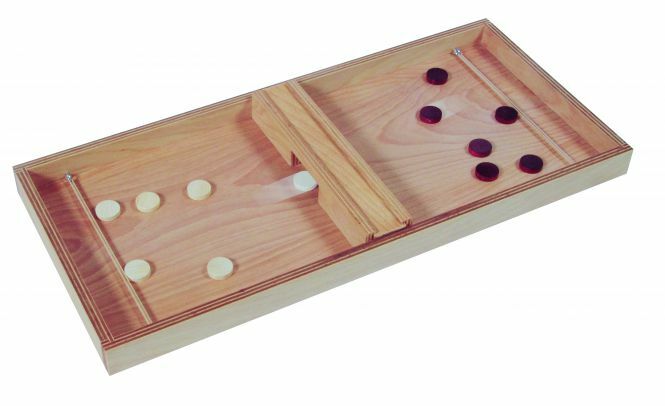 This may be difficult, because at the same time, pieces will be zooming across from the opponent. It is possible to adjust the tunnel width for different levels of difficulty by moving the blocks within the tunnel to a different peg position. The winner is who shoots all the pucks of his own color into the opposite field first. For a more challenging game try to shoot all pucks through the tunnel until you side is completely clear. The first player with no pieces left in his field at all wins the game.